Chiropractor Overland Park: How Chiropractic Can Help Make 65 the new 45! 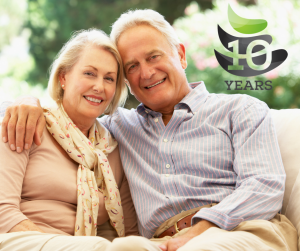 The aging process can usher in a variety of conditions and health issues! (Uh) Chronic pain, arthritis, loss of mobility, and other issues can occur as a person gets older, but since 65 is the new 45, many patients are finding that chiropractic provides some great benefits to keep them moving and shaking! Regular (and very gentle) chiropractic care has been shown to increase spinal range of motion as well as in the extremities. Limited range of motion can occur due to age or inactivity— sometimes a combination of the two. Having the ability to move easier has many great benefits. It allows us to more actively engage with our environment. We can go dancing, get on our hands and knees to work in the garden, bend down to pick up grandchildren, and improve leisure activities like golfing. Increased range of motion is one of the most common (and appreciated!) benefits of gentle wellness chiropractic treatment. Overland Park Chiropractic care is a very effective treatment for decreasing the degeneration of the spine and even other joints. When the body is in proper alignment, it no longer has to adapt through postural compensation. This reduces stress on the spine and joints while relieving pain and restoring mobility. Chiropractic has long been recognized for its effectiveness in providing drug-free pain relief for everything from back pain to headaches to arthritis. While pain medication and anti-inflammatory drugs only suppress the symptoms (and are sometimes needed), chiropractic addresses the root of the problem. There are special receptors that reside along the cervical spine in the rear of the joints. These receptors work to send vital messages to the brain regarding coordination and balance. When the spine and, especially the neck, are out of alignment, it can hinder how these receptors send and receive messages to the brain. The result is a condition called loss of proprioception, or sense of body awareness. Bottom Line…. adding gentle chiropractic wellness care into your routine will help make 65 the new 45! If you are looking for a gentle chiropractor in the Overland Park area with over 10 years experience, give us a call at 913-681-7757, or reach out to us online.